It was a crazy kind of weekend (in a good way), and I was so happy to meet some of you at Canada’s Baking & Sweets Show! Such fun meeting kindred cookie-decorating spirits, and as usual, I neglected to get photos – I am a little camera shy myself but I’d love photos of you to remember the weekend by, if you’d like to send them to me or tag me somewhere on the social media sphere. 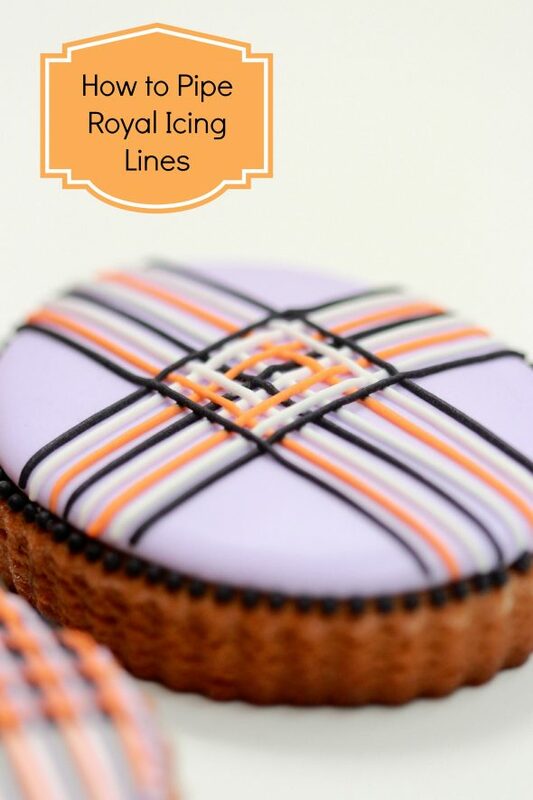 In preparation for some cookie decorating demos, I played around with Halloween “themed” royal icing, and thought I’d share a piping royal icing lines recap below for you. 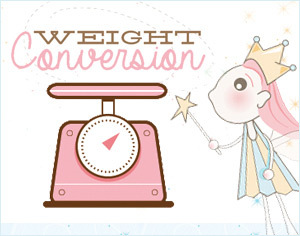 Please click HERE for a detailed explanation of each tip. Again, you can find a detailed explanation of all these tips HERE. I’ve got a video for you on how I pipe lines here (and below) as well. 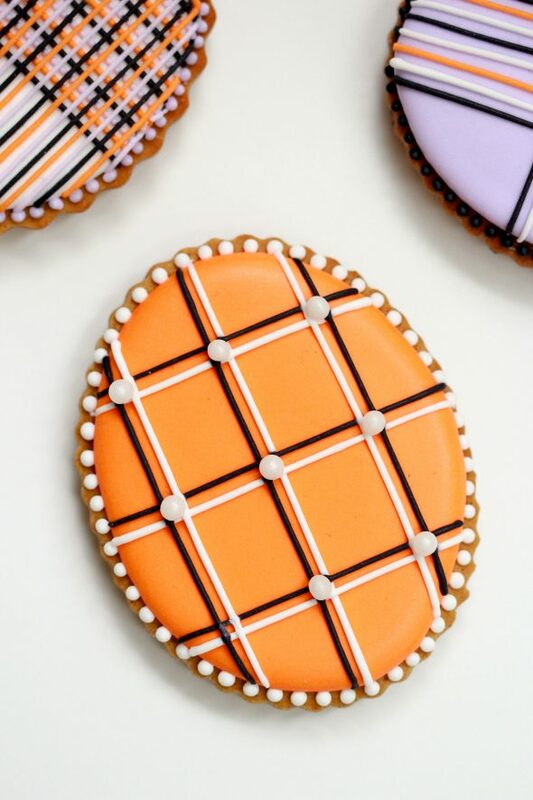 Did you notice one of the edible pearls on the orange cookie fell off sometime during my demos this weekend? I didn’t notice until now – oops! 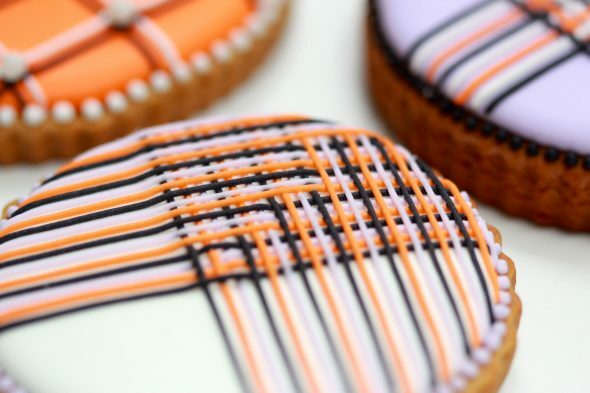 Piping lines is really such a fun and easy way to decorate with a few key tips, it’s a perfect way to use up some leftover geometric cookies, as they can easily be matched to any theme. Every time I play around with this technique new designs happen, and I’d have to say, it’s probably my second favorite way to decorate, next to marbling icing. Hope you have fun with it too, and happy decorating! I’ll take your cookies for inspriration for my cookies! looks beautiful but I don’t think I would have the patience to make any of these. I applaud you for a job well done. You never know! I didn’t think I would either, but it gets fun, really! 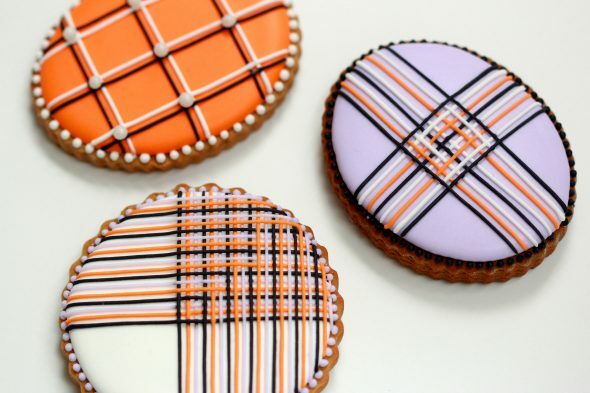 Marian, your skills never cease to amaze me – these cookies are stunning. Something to aspire to for folks like me! Beautiful! Thanks Mardi! I’ll bet you and your Petit Chefs are already on your way to being experts! I wonder if I can EVER make such straight lines like yours!! 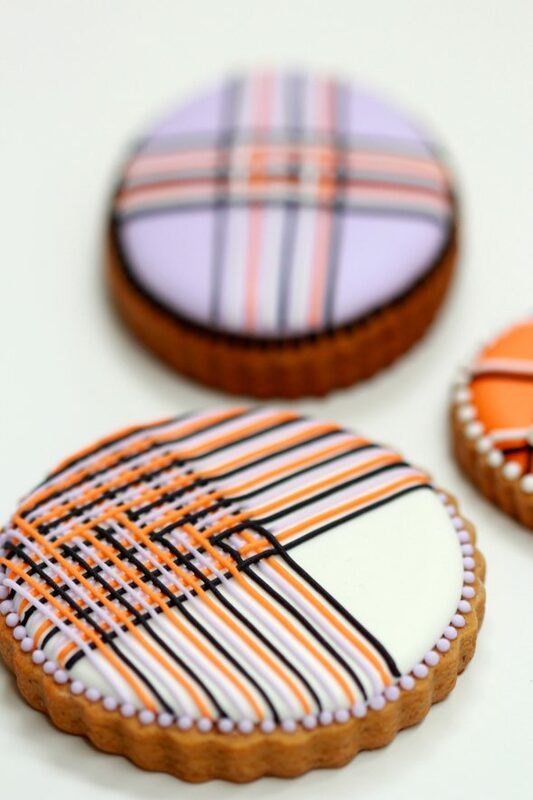 Beautifully done cookies. Amazing job! Absolutely, you could! Thanks for the sweet comment! It was so great seeing you this weekend! It was a real pleasure being able to watch you in action! You’ve inspired some cookie decorating in the very near future! It was great to see you as well, Julie! Hope you enjoy decorating, and if you have any questions, am happy to help! Marian my lines never come out even and straigh, no matter what I do. They’re usually wider in the beginning too, and get thinner as I move along for some reason. Thanks so much for the tips. I am going to keep working on this. Yours are just perfect! Mine come out wider at the beginning as well… It’s hard not to put too much pressure at the beginning. I often use a toothpick to scrape a little of the excess off. If they get a bit thinner as you go along, try and pay attention to see if you’re pulling the line of icing, instead of letting it fall. WOW! So cool! You are beyond talented! Wow! Your technique is unbelievable! Love this tutorial! goodness, these lines are SO precise and SO perfect!! how do you keep a steady hand? haha i’d be shaking all over the place!! Good seeing you again and chatting about teaching and baking! As usual your demos and incredible work left me inspired! I always learn so, so much from everything “Sweetopia”. Good day to ya Marian!!! I just adore your site and these cookies and your talent are the reasons why! Everything you show and teach us, is fun. It’s beautiful. It’s relaxing. It gives such pleasure to hide away for a while from everything else that is going on in the world and immerse ourselves in happiness. Thanks so much for this post, and for all the other posts you have ever shared with us! Blessings! Really outstanding, Marian. Love your colour choices, too! Marian, thanks for posting this great tip, you make it look so easy I was just mesmerized watching you do all those lines. Love, love, love your cookie decorating. I am the worst t this- I have a lot to learn about decorating with icing- what a great tutorial! Thanks so much, Peggy! Funny how many times I was looking at the cookie, but never noticed, too! Hi Marian. I reference your site often for techniques and I am so appreciative for all of the beautiful cookies and cupcakes etc that you put on here and then share with us. I use both your sugar cookie and RI recipe for my cookies and everyone loves loves loves them (I do too). I watched the video and I think you said you use the 10 second icing for the lines as well as the flooding. What about for the ball borders? Perhaps my icing was a little less than 10 second, but it seemed like the balls were flattening out too much when I tried with my regular flooding icing. UGH this timely post just reminded me I should be baking cookies for my little ones birthday this Saturday. I hate the rolling and baking of the cookies, i have no space in my fridge to chill things. Wish I could get pre baked cookies and just decorate! Beautiful!! How do you over lap the lines?? Is there a technique for that? Gorgeous as usual! Wish I was as talented as you! Just stunning, Marian. Truly works of a art! beautiful amazing work. You are the best! Love all your work. I hope you had a great time at the show last weekend. Thank you so much for sharing this with us. I am a butter cream girl through and through but your tutorials tempt me very much. Gorgeous cookies and beautiful page. Aw, thank you so much, Yvie, for your sweet comment! These are just perfection and so precise. I need to practice more!